What Ever Happened to the “Original Green Building”? 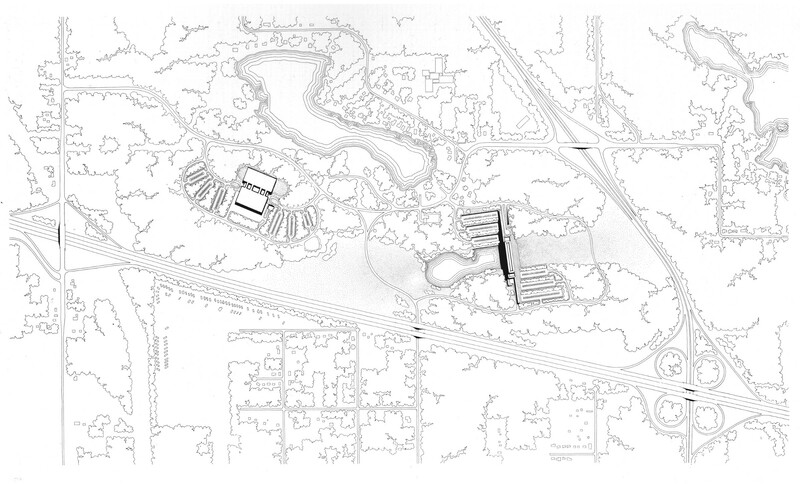 A suburban office campus from the 1970s reveals the enduring potential of ecological design. 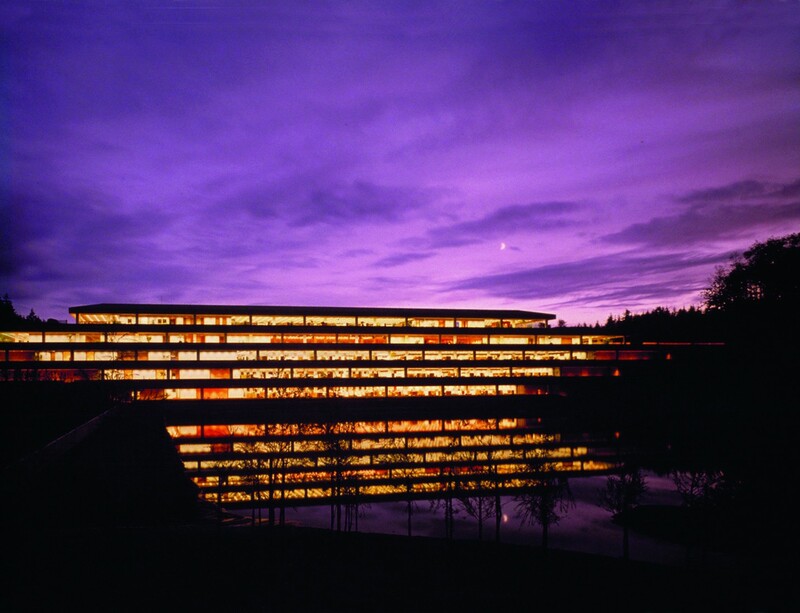 At first glance, the former Weyerhaeuser Corporate Headquarters in Federal Way, Washington strikes the eye as more an enigma than a piece of architecture. Nestled within an idyllic meadow between two gentle hills, the terraced, low-slung building integrates almost seamlessly into its lush surroundings. English ivy envelops its stepped roof-line of monumental concrete slabs. The building appears to exist out of time, both unmistakably modern and ancient — a quality enhanced by the fact that, since 2016, the structure has been conspicuously vacant, taking on the air of an exceptionally well-maintained ruin. Not surprisingly, the photogenic site has become a popular destination for Instagrammers and (sub)urban explorers. Historian Nicholas Adams has characterized the Weyerhaeuser project (recently renamed Woodbridge Corporate Park) as “one of SOM’s most significantly underappreciated buildings.” But though the project may appear an outlier among the firm’s predominantly vertical icons of 20th-century architecture, the departure from a supposedly prevalent style speaks to the reality of a wide-ranging and adaptive portfolio. The building has had a profound influence on architecture in the Pacific Northwest and beyond, and its most distinctive elements have helped form the DNA of SOM’s approach to sustainable design in the 21st century. Rendering of Weyerhaeuser Corporate Headquarters, drawn by Carlos Diniz. Courtesy of The Archive of Carlos Diniz / Family of Carlos Diniz. The archive is now hosted at the Art, Design & Architecture Museum of the University of California, Santa Barbara. 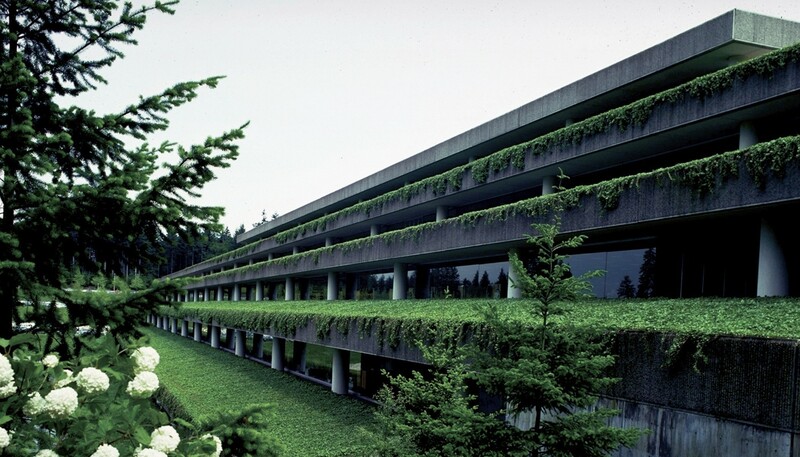 Singular upon completion in 1971, the “original green building” was designed by SOM as a new home for the Weyerhaeuser forestry company. The “groundscraper” serves as the centerpiece of a bucolic, 260-acre site planned by acclaimed landscape architect Peter Walker, then a partner at Sasaki, Walker and Associates. The campus includes a botanical garden, bonsai museum, and publicly accessible running and hiking trails — uncommon features for a nominally private office park. 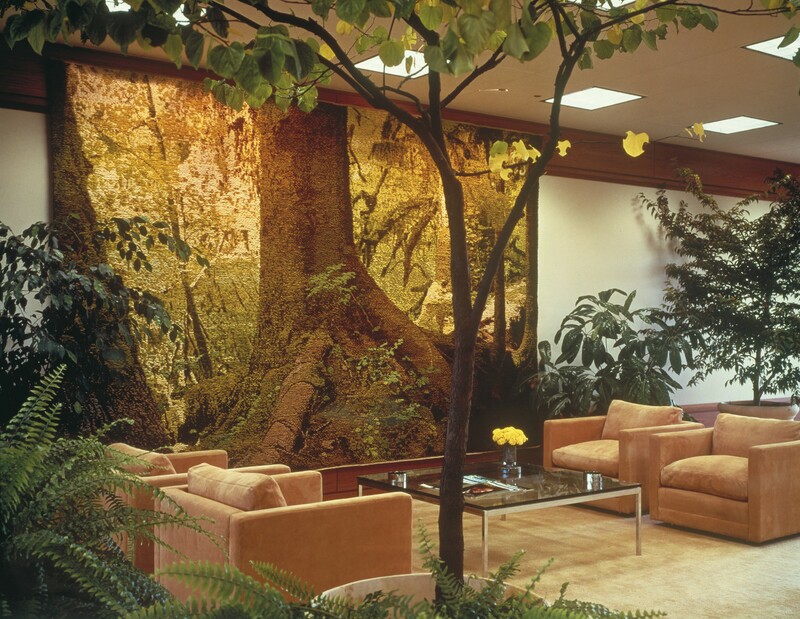 Going beyond an eye-catching form, Bassett’s and Walker’s primary innovation was to interface the headquarters directly with the existing natural ecosystem around it. Going beyond an eye-catching form, Bassett’s and Walker’s primary innovation was to interface the headquarters directly with the existing natural ecosystem around it. Though tree cover was pulled back slightly to create clear views of the building from nearby highways, the site was left largely unaltered. Necessary interventions were made with careful consideration for how to positively impact, even augment, the landscape. The headquarters building functions essentially as a dam, transforming the site’s natural, shallow creek into a small lake at the building’s northern end. The remaining outflow of this creek is diverted underneath the building toward the meadow to the south, irrigating wildflowers and native grasses. The building itself incorporates both passive environmental design principles and energy-saving technology. Extensive, floor-length windows let in ample natural sunlight, decreasing the need for artificial lighting. A heat recovery chiller — which stores heat discharged by the cooling system for later use — also provided substantial energy savings in comparison to other modernist buildings of its era. When first installed, this novel, all-electric temperature control system was actually so quiet that Weyerhaeuser found it necessary to pump “traditional” HVAC sounds through the building’s intercom system to provide greater privacy to its employees. Embedded into every aspect of the design concept was a desire to elevate the everyday experience of Weyerhaeuser employees. SOM also collaborated with Knoll International, the office design firm, to implement one of the country’s first-ever interior open-office plans. Flexible office space was becoming more common in Europe at the time, and Weyerhaeuser executives had traveled across the Atlantic to see the “open landscape” concept first-hand. Knoll helped develop a system of dividers and modular furniture that could create enclaves of collaboration or privacy, depending on what different teams within the company required. Embedded into every aspect of the design concept was a desire to elevate the everyday experience of Weyerhaeuser employees. The forest-like environs of the building’s exterior were complemented with over 1,000 potted plants scattered about the office interior. The company spent more than $2 million on furniture and artwork — the latter personally curated by Bassett. Anticipating the kinds of amenities popular in workplaces today, the building included a cafeteria, library, barber shop, and gym. 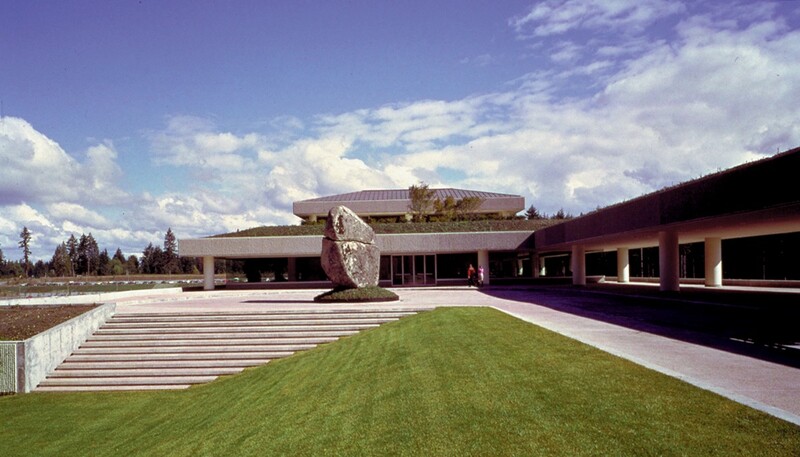 And, of course, there were connections to nature, including panoramic views of the surrounding landscape on each of the structure’s five levels: on the northern-facing side, a placid lake; on the opposite end, Mount Rainier looming in the distance. As Walker recalls, “It was like there were no windows at all. Everyone in the room had some angle on this huge landscape.” The palatial scale and stunning beauty of the campus was meant to be enjoyed by all — an unusually egalitarian gesture for a mid-century corporate office building. The campus served Weyerhaeuser well for more than 40 years. But at a moment when its pioneering ethos started to really take root — notably among tech giants such as Facebook and Apple (Steve Jobs had apparently been an admirer of the Weyerhaeuser headquarters) — the company decided to leave its “groundscraper” for a new campus in Downtown Seattle. The company’s pursuit of a new urban headquarters is symptomatic of more general economic pressures acting upon large office campuses, regardless of how green they may or may not be. The need to streamline headquarters functions — or to have greater access to the talent pools and cultural amenities often found in larger cities — has drawn many corporations away from suburban campuses to denser urban neighborhoods. This trend has challenged preservationists and developers alike to think creatively about the adaptive reuse of campuses like Woodbridge that hold special aesthetic or historical value. The Bell Labs Holmdel Complex in New Jersey, for instance — a once-renowned research and development facility designed by Eero Saarinen — had fallen into disrepair and faced the threat of demolition before its eventual redevelopment as a mixed-use “metroburb,” replete with co-working spaces, a retail gallery, and public library. There is little doubt that the site will continue to serve as an evocative and highly popular backdrop for the occasional vintage car shoot or dog portrait. The fate of the former Weyerhaeuser campus, on the other hand, has not yet been resolved. The site, and SOM’s iconic building with it, have been purchased by a developer seeking not only to find new tenants, but to potentially build infill structures. At the same time, a group of local activists have been working to preserve the beloved campus in its original state. Yet both sides of this debate agree that “the skyscraper on its side” holds the key to the site’s future. Its proximity to both Seattle and Tacoma, and the airport they share, still make it an accessible and appealing location, while the building’s open plan and unique exterior make it especially adaptable to a variety of uses. There is little doubt that it will continue to serve as an evocative and highly popular backdrop for the occasional engagement shoot, nature photo, or vintage car portrait. Meanwhile, SOM has continued to evolve many of the design principles that originated with Weyerhaeuser Corporate Headquarters. The building’s signature green roof is evoked through projects ranging from the Greenwich Upper Academy School, to the JTI Headquarters in Geneva, Switzerland. Far surpassing the energy-saving heat recovery chiller available when the Weyerhaeuser headquarters was constructed, SOM has integrated cutting-edge sustainable building systems into everything from public schools to supertall high-rises. The firm has developed compelling research into high performance design, from structural biomimicry to water-purifying building facades. And, recognizing the innate connections between sustainability and a building’s lifespan, SOM has led an increasing number of adaptive reuse projects, including those focused on some of its own legacy structures. The enduring appeal of the Weyerhaeuser campus — its spirit of experimentation and optimism about an ecological future — informs SOM’s commitment to a more sustainable built environment. In the face of challenges brought about by a changing climate, the building remains an important lesson in how to make design choices that resonate throughout time — bridging human experience and the natural world. SOM would like to thank Peter Walker for lending his valuable insight to the development of this story.